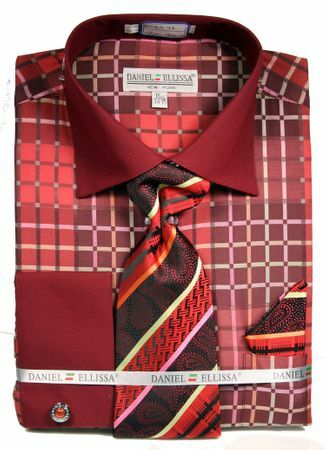 First impressions always count and when you are shopping online for unique fancy style mens french cuff dress shirts with an Italian designed look, Daniel Ellissa is a brand to really consider. This burgundy checker color two tone style dress shirt features contrasting collars and with a nice square pattern design with french cuffs and the matching tie combination shown. Fabric is easy care Poly/Cotton Blend. Learn More About French Cuff Dress Shirts Here. Read How to Measure your Dress Shirt Size.